Wonderful time!! Grace was fabulous and so much fun. It was a great girls' day out!!! Everyone should check them out!!" ​Grace loves to bring belly dance to everyone; she's given lessons at bachelorette parties and other women's gatherings. She'll provide a 55-minute low impact dance lesson; introducing everyone to the fun that is inherent to belly dance. This family-friendly event can be at your location or at The Dance Spot. 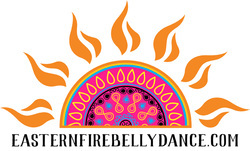 Please feel free to contact her at 630-988-4443 or email easternfirebellydance@gmail.com.